Leather Corals are members of the largest group of Octocorals found throughout the world! Leather Corals are some of the most attractive corals found in the world's oceans. They are flexible and soft, but they also have a "leathery" feel. A type of soft coral in the family Alcyoniidae, they come in rich assortment of colors and shapes, The hardiest and most readily available for the aquarium are corals in the Sarcophyton, Lobophytum, Sinularia, and Cladiella genera. Leather Corals are Soft Corals, but like the stony corals they are Cnidarians, meaning stinging celled animals. Their family, Alcyoniidae, is a member of the Alcyonacea Order. The Alcyonacea Order itself is part of the Subclass Octocorallia, known as Octocorals. This means that each polyp has the characteristic eight pinnate tentacles and eight septa used to gather and distribute food to the colony. Taking many exotic forms, Leather Corals are quite fascinating. They often have a very rich and colorful palette. Soft corals in general have all the colors of the rainbow, but their predominant hues are rust, red, orange, yellow, olive and purple. Many types of Leather Corals are easy to keep with great success. These are also some of the best beginner aquarium soft corals. Many species thrive and will grow quickly in captivity, and many of the popular Leather Corals are successfully propagated in captivity. Leather Coral Facts Leather Corals are members in the Family Alcyoniidae. They form the largest group of Octocorals found throughout the world. The Alcyoniidae family is found just about everywhere except the Atlantic Ocean, which has only a few deep-water species in the Alcyonium Genus. These are found in a number of habitats, but primarily reef flats. They are also found in shallow waters close to shore where they may be exposed during low tide. These species are also found on reef flats, well as in lagoons. This is one of the most predominant of all the soft corals. They inhabit many diverse locations, but especially shallow waters with strong water movement. These have a very wide range that includes back reefs, reef slopes, and reef flats. Small cuttings of Leather Corals are easily collected from the wild. They are less prone to damage or ailments from collecting and shipping than the stony corals, or than the Octocorals known as Gorgonians. Mosts species thrive and grow quickly in captivity with many of the popular Leather Corals successfully propagated in captivity. Leather Coral Care Leather Corals are quite hardy and some of the easiest corals to keep. They can grow into beautiful, impressive specimens in the soft coral reef tank. They are considered the best beginner aquarium soft corals, are commonly available, and for the most part are reasonably priced. They are also easy to propagate in captivity by simply cutting them into coral frags. A typical reef environment is what is needed for Leather Corals. They are generally very hardy and will thrive in a properly maintained reef aquarium. Most need a moderate to strong water flow and tend to do very well under various types of reef tank fluorescent lighting. Metal halides are not needed. They do need good water quality maintained, so a protein skimmer and frequent water changes are very helpful. Leather Corals will sometimes become a surrogate host for clownfish if there is no host anemone available. However, they can be toxic to other sessile tank mates. They don't have a strong sting from their tentacles, but they do emit chemicals to ward off other corals competing for the same space. Provide plenty of room between them and other corals, at least a few inches. Excellent filtration with a protein skimmer, along with activated carbon, can help to remove and control some of the toxin. But Leather Corals can do best when kept in a tank dedicated to softies or a very minimal mix with other corals, depending on the type and space available. They are also easy to propagate in captivity by simply cutting them into coral frags. Sometimes Leather Corals will shrink, and may appear to be dying. This is a natural event where they shed their outer layer and then regrow it. When you see this, they are generally fine and it will just take a little time before they are back to normal. Feeding Leather Corals Like the stony corals, Leather Corals obtain their nutrition from multiple sources. They receive most of their nutrients through a symbiotic relationship with marine algae, known as zooxanthellae. They also capture planktonic organisms and microscopic food particles from the water column and can absorb dissolved organic matter. Leather Corals live in symbiosis with the marine algae, zooxanthellae, and derive the majority of their nutrition from it. Yet in captivity they usually will eagerly accept small foods like brine shrimp and plankton as well. They will also benefit from occasionally soaking the food in vitamins. Their polyps can completely retract into the surface. It is common for soft corals to change forms, even within a single species, to adjust to different water flows and types of prey. Leather Coral Identification Leather Corals are Cnidarians, which means stinging celled animals. They are also members of the Subclass Octocorallia, known as the Octocorals. These are corals that generally have eight-fold symmetry or eight-branched tentacles in their polyp structure. Leather corals are primarily colonial sessile animals, meaning they are anchored firmly to the substrate, and from there they can be either erect or encrusting. They can have either a fleshy or leather-like texture and include some of the most vibrantly colored corals. These corals have many colorful hues, but are predominantly yellow, orange, red, rust, olive, and purple. They tend to have a more leathery feel, while other Soft Corals tend to be sticky or slimy to the touch. The hermatypic, or reef building corals, are the stony corals. Leather Corals are not reef building corals because unlike the stony corals, they do not have a rigid calcium carbonate skeleton. They are composed mostly of living tissue, though they do have tiny calcareous components called sclerites. The sclerites are spiny skeletal elements embedded within the Leather Coral's tissue. They help to give lthese corals some support and add a grainy texture. They are also used to help identify them at a microscopic level. Though leather corals don't add large calcareous masses to the reef like stony corals do, their sclerites do add large amounts of sediment to the reef. The Leather Coral's entire surface, known as the coenenchyme, is covered with small polyps. The polyps consist of two types of polyps, the autozooids and the siphonozooids. Types of Leather Corals Leather Corals are members of the Order Alcyonacea and are then placed in the Suborder Alcyoniina (‘true' Soft Corals). The Order Alcyonacea itself is part of the Subclass Octocorallia, known as the Octocorals. These are corals with eight-branched tentacles in their polyp structure. The systematic classification of Octocorals involves a huge, highly complex, and diverse group which at present is considered poorly understood and understudied. Current taxonomy is under constant flux. So it is to be expected that classifications will continue to change. In fact many experts are in favor of a complete revision. Although these are in the Alcyoniidae family they differ from the leather corals because they are slimy to touch rather than leathery. Therefore we have included them in with the Soft Corals. The surface of these corals tends to fold or create finger-like extensions or lobes. Thus the common names include Finger Leather Corals, Cabbage Leather Coral, Lobed Leather Coral, and Devil's Hand Coral. These corals can have a tree-like shape or a thin flat form. They can also be very limp or flaccid, so are commonly called such things as Flexible Leather Coral, Cabbage Leather Coral, Knobby Leather Corals, Flat Leather Coral, and Finger Leather Coral. These corals are not as easy to keep, nor to propagate, as other Leather Coral Varieties. They tend to form low knobby stalks, thus they have common names like the Finger Leather Coral, Colt Coral, and Stubby Finger Leather Coral. These are hardy Leather Corals characterized by a distinct stalk with a broad top, called the capitulum. They need a lot of space as well as a strong water movement and high intensity lighting. They are commonly known as the Toadstool Coral, Cup Leather Coral, Leather Coral, Mushroom Leather Coral, Trough Coral, as well as one species known as the Elephant Ear Soft Coral. Soft Corals for Beginners Soft corals include many of the easy to care for coral favorites. This is especially true for the Leather Corals in the Sarcophyton, Lobophytum, Sinularia, and Cladiella genera. These are the considered the best beginner aquarium soft corals. They tend to have a more leathery feel, while other Soft Corals tend to be sticky or slimy to the touch. Leather Corals: Leather Corals are generally very hardy though they do need a typical reef aquarium environment. Most leather corals need a moderate to strong water flow and tend to do well under various types of reef tank fluorescent lighting. Metal halides are not needed. 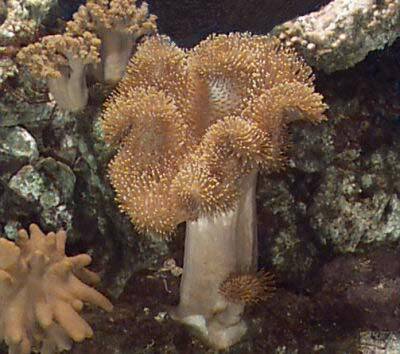 Other types of Soft Corals: There are hundreds of other types of soft corals. Each of these beautiful animals will have care requirements that are just as diverse as they are. Consequently not all soft corals are easy keepers. It is very important to learn about the soft coral species you keep for a successful reef aquarium. Palm Tree Polyps Clavularia sp. Waving Hand Coral Anthelia sp. The Xenia species are also sought after, especially the fascinating Pulse Coral Xenia sp. My very large leather coral has detached itself from its rock, so I took some advice and put a large wooden skewer through it and rubber banded it to a large rock. Well today it ripped itself off the skewer what do I do now? I sounds like it doesn't like where it is located. Try moving it around the aquarium to places with more light, less water flow, etc. Whatever is different from what it has now in hopes of finding a place it likes. Do toad stools bleach. I have a real nice one losing his color. How do i correct it? Most of the time color changes in corals are related to the tank lighting, rather than coral bleaching. Coral bleaching is where there is a mass expulsion of zooxanthellae. Most likely your coral has zooxanthalle but not enough lighting, so you are losing color. My leather coral looks exactly like your picture, right down to the little one underneath it. My question is should I leave the small one there, or move it to more light? As long as you can move it without damage to the small one and/or the parent. As you suggest it would probably be better to put it in a place with more light but my only concern would be damage to the corals. If they are already separated, I'd go ahead and move it, otherwise without further research about how they are propogated I would wait.